Summer is here! It seems that we’ve had lots of warm weather all over Australia recently. I love this time of year because of the wonderful produce that is available to us all. One of those special treats for me is mango. I don’t eat a lot of them because of the sugar content, even though it is a natural sugar if I’m sticking to a keto way of life I tend to avoid it. However, for those of us who just want to eat Healthy, there are many reasons why you should include this delicious fruit. Mango flesh is rich in pre-biotic dietary fiber, vitamins, minerals, and poly-phenolic flavonoid antioxidant compounds. It is an excellent source of potassium, vitamin A, vitamin C and vitamin B6. Even better is that they taste great. This recipe was given to me by my dear friend, Elisabeth Higgins. Of course, I had to put my own “Healthy Spin” on it but thank her for her generosity in sharing. No: Gluten / Grain / Dairy / Soy / Refined sugar. 1. Add ginger to the mixing bowl and chop with MC on / 5 secs / Speed 9. Scrape down. Repeat if necessary until finely chopped. 2. Add mango, coconut cream, water, lime zest and lime juice. Blend with MC on / 30 secs / Speed 8. Scrape down, blend again with MC on / 30 secs / Speed 8 or until very smooth. 3. Add chia seeds and mix with MC on / 20 secs / Speed 3 or until incorporated. 4. Pour mixture into serving bowls, leaving space from the top for your decorations. Use clear bowls/jars for extra effect. 5. Preferably chill overnight or at least for 4 hours in the fridge. 6. Decorate just before serving. DOUBLING THIS RECIPE: You can double this recipe easily. You may need to assist the final mixing step by using the spatula through the hole in the mixing bowl lid to make sure everything is combined. 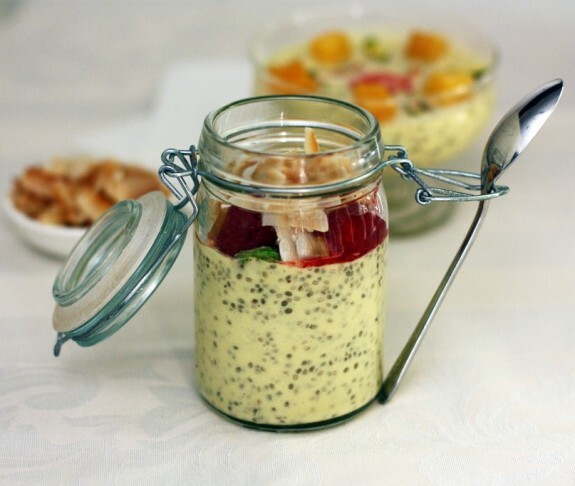 * Using black chia seeds will result in a firm pudding consistency once set while white chia seeds don’t swell up quite as much and the puddings will be a softer set. I used 50/50 black and white seeds. Either choice will not alter the flavour. * Keep these covered in the fridge for up to 4 days. Great for preparing ahead as a “grab and go” meal. * Use anything you like to garnish. 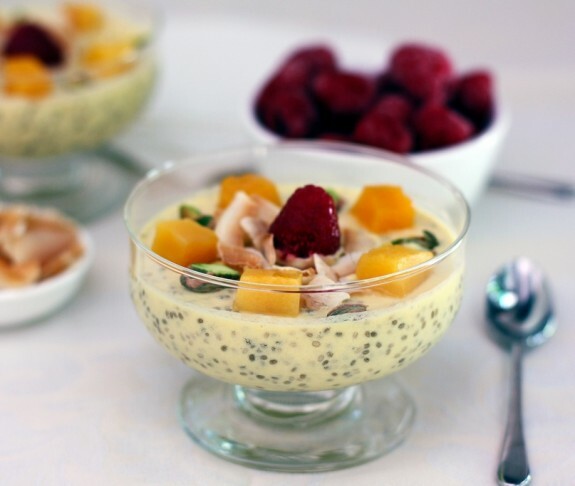 * You can substitute the coconut cream and the water for a total of 400g coconut milk. * For a Low Carb option, substitute the mango for raspberries. * You can use frozen fruit, just add it to the mixing bowl with the ginger in step 1 then continue with the recipe. taste: 10/10 These were a hit for our “first week back” in the new year and will be for a while to come. would I make it again: Yes!!!!! with different flavours and even my Low carb version.